3 Feedbacks on "Mystery of the Sea"
Talked about it today at work with other Vets including a former Naval Officer. Very very fishy. Why do they all look like fat Navy Reservists? Why surrender? No way could 2 boats get that lost and if one broke down, the other would just tow it. Hey, it’s nothing. The media didn’t cover Benghazi in 2012, either. 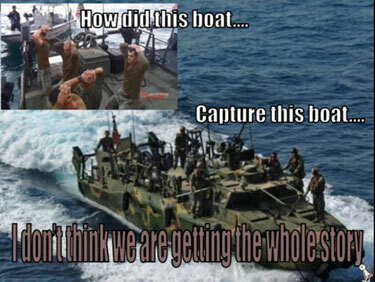 If this were the WWII Japanese Navy, there would be a number of seppukus/suicides. 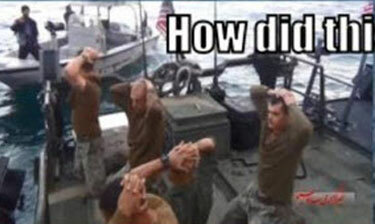 Apparently, Obama and his enablers don’t want in his victory-lap year, a latter-day USS Liberty-type crisis. It looks like they surrendered to Marco’s luxury fishing boot.